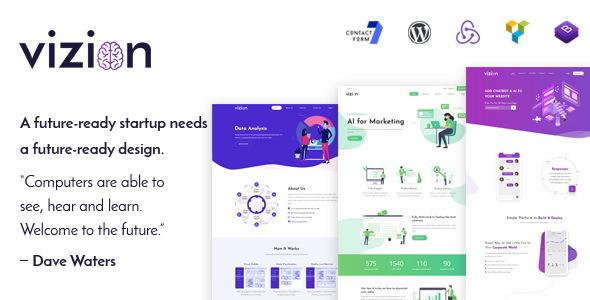 Vizion AI Startups is a stand-alone theme for all your future-ready AI startups. With many pre-built sub-pages and easy to integrate images, you can easily customize. The pixel perfect design and clean coding assure the highest quality standards just like our other themes. As we know that artificial intelligence is been infiltrating the marketing world for some time now; we aim to power brands by giving an excellent online user experience and manage cross-channel promotions with the latest Vizion AI. We have released three home pages – Digital Marketing, Data Analysis, and Chatbot. We’re working on another two: homepages – AI in Security and AI in Marketing. All the inner pages are created to straighten up the process of bifurcating business profile and productivity goals of the company. AI Data Analytics enhances the data and gives an alternative to display in smart infographics. Further, there is a services section, that will highlight the product and offering of a brand. The color palette is soothing green and white that represents an efficient and utilitarian side of design. Chatbot, has a cool quotient of bright purple and Data Analysis is distinctive bright color mix. The contact us section has a user-friendly contact form that makes easier the brands. Additionally, we are adding a few more like AI/Ml Theme Concepts in security and marketing soon. Vizion AI Startups is incorporated with inner pages like pricing, blog, contact, about and more. You get a landing page with Bootstrap 4, Future-ready design. Vibrant colors, chatbox, working contact form, free support. It saves time to build your template from scratch. We provide the best possible sections you would ever need for a startup as well as for businesses. The theme is ideal for Virtual assistance startup company, Travel agency, Retail industry, Media & Entertainment and others in the startup league. We offer support and assistance to our customers Mon-Sat 9:00am-7: 00 pm (GMT +5:30) – we are located in India. We effort to reply on all questions within 48 hours.